Plain water on its own is not sufficient for the windscreen washer system. The container for the windscreen washer contains the cleaning fluid for the windscreen and the headlight washer system* ⇒ fig. 260. Container capacity:gggggg 321. Plain water on its own is not enough to clean the glass properly. It is therefore advisable to add a suitable washer fluid additive (with wax solvent) to the water. 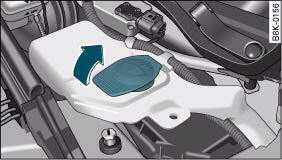 A washer fluid with freeze-resistant additive should be used in winter. • Never put in radiator anti-freeze or other additives. • Never use washer fluid which contains paint thinners or solvents as it can damage the paintwork.